ART BOOKS: WHAT A SCORE! The best part is that these are over-sized books, except for one, and I got all five books for $10!! It was a steal. I love reading about artists, especially these great ones: Norman Rockwell, Rembrandt, Ce`zanne, and the post-impressionists. This is the outer cover of the book on Rembrandt. And the book slides inside the cover which is cool! And lastly, Cezanne and the post-impressionists! So now, in addition to everything else I’m doing I will be reading about these great artists and eventually share about them here. I know I can find anything on the internet these days, but I still LOVE reading books!! That is one thing that will never change about me. In the meantime, I began working on a painting of a seahorse yesterday afternoon. And it is a bright color! I don’t know when I will finish it, because I need to work on my story for my class and work out today. So that’s about it for now. I hope everyone is having a great week so far. Meet Sandy the Great White Shark! This is what (or who) I’ve been working on for the last couple of weeks on and off. I tried drawing it once, but ended up throwing that one away. Then I tried again, and was satisfied with how it turned out. So I traced it onto watercolor paper and painted it yesterday. I am still planning to paint sea creatures in acrylics on the rest of my son’s toy box pieces…eventually. And repaint his room…eventually. So I have lots of projects lined up for the summer, but they will probably take longer than that to get done. I may take a break from the writing class for a couple of weeks. The good thing about this class is even though I work toward deadlines to get the assignments done, I can ask for time off which I haven’t done yet. But this is the time of year I love painting the most! I have been itching to get back to my Chinese brush painting as well which is always on my mind. I hope everyone is having a beautiful spring season. I know our son is! He left on Sunday for King’s Canyon National Park and won’t be back until the end of September! His dad drove him there and spent the night talking with corps. members and some people he knows. He took great pictures of everything and is working on them for his blog. I sent our son his first package the other day which he should get next week. The mail only goes out to them by mule, I think, once a week on Mondays. I sent him a book of stamps, a box of envelopes, a spiral notebook and pens, because he forgot to get that stuff so he can write to us. Our daughter’s crew will start going out on eight-day trips (called spikes) next month. So she will have a schedule of being gone eight days and home for six days. That will be fun to have her here every other week. We will get to spend more time together this summer. Well, that’s all the news I have for now. I wish I could post more often these days, but I don’t think that’s going to happen until I am done with this class! Today I took a nice fall walk with my husband all around the hatchery. When I came home, I decided to do a little painting. It’s about 5″ x 7″. The yellow and orange leaves of the hatchery’s sycamore oak trees were my inspiration. Here is what I did last Sunday afternoon. 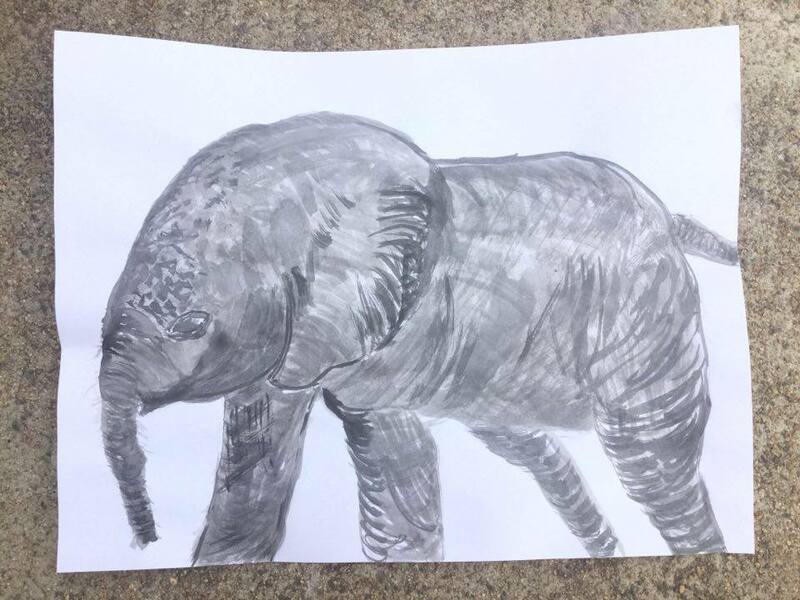 An elephant (which I sketched from a painting I did for my daughter a few years ago.) This Sumi-e ink drawing is a little different from the painting I did. Here’s the Sumi-e ink drawing of my elephant. It was a quick sketch (that back right leg looks a little skinnier than the rest!) Ha, ha! And a couple of Cardinal birds. One is puffy from the chilly air. I was looking in a bird book for this one and did a rough sketch of two different photos. 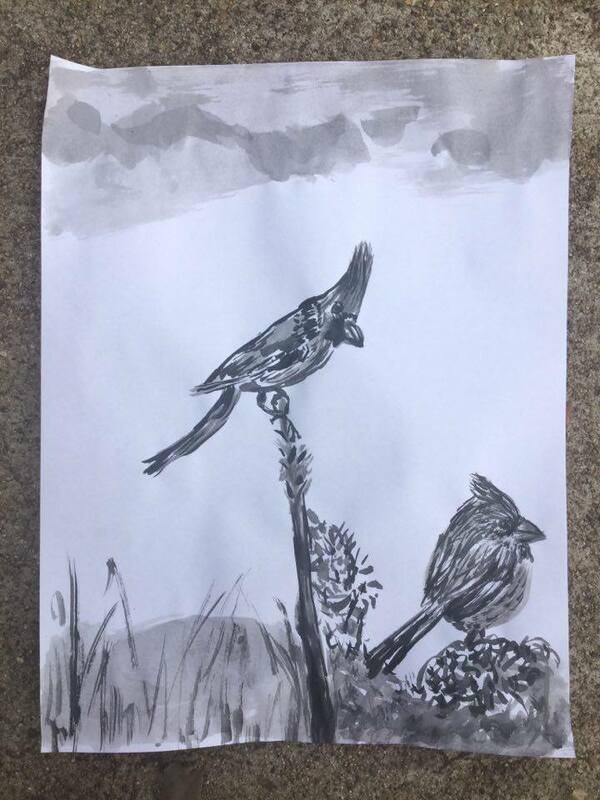 I am planning to do a watercolor of a Cardinal in honor of my mom. She loved them even though we never lived anywhere where they could be found. And now for a little of bit of self-promotion which I rarely do. I had the original painting of “Grace’s Elephant” printed on 5×7 cards that I am still selling for $5. I only have a few left. I have not gotten re-prints of any of my cards yet. So I occasionally sell some and have used some to accompany gifts I have given people. The two card prints I am currently out of are the ones titled “Sherri’s Ocean” and “Danny Boy” (the horse.) They were my best sellers besides “Grace’s Elephant.” I still have some of those left, though, because I ordered two dozen of those to begin with. A lot of my daughter’s school friends wanted her elephant a few years ago. 🙂 The other cards I have are of the blue hydrangeas acrylic painting I did, a pink rose painting, and one called George’s Alpenglow. If you would like to purchase any of my art, I have an art page on Facebook. You may message me on there about anything you may want. I do not have any online payment plan set up, however. I would have to get your address and give you mine to send me a check. Unfortunately, I haven’t figured out how to do all of that yet. I will have a lot more time to do all of this when my daughter graduates from high school in May!! 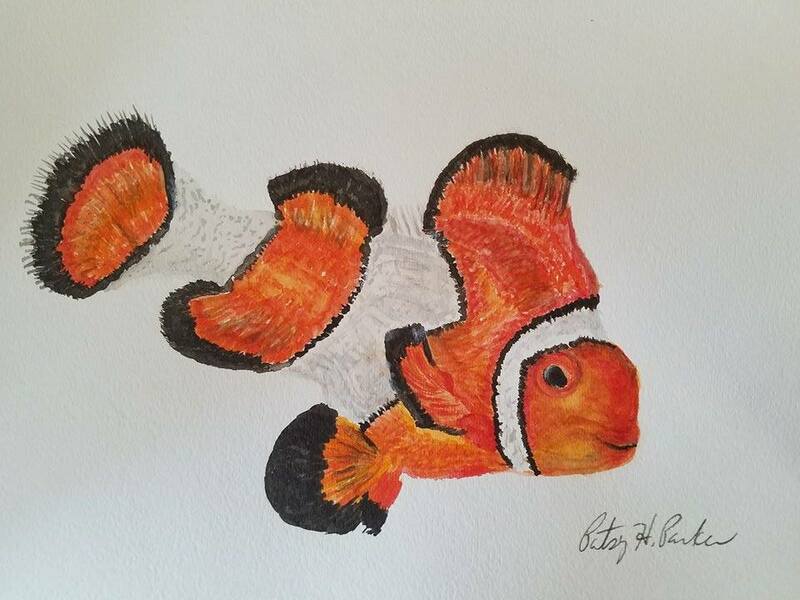 Meet Clara, the Clown Fish! Yesterday I began this painting by using my Chinese ink and brushes to paint the black parts of the fins of this clown fish. I left the white of the paper for the white of the fish. Next I began painting the oranges and yellows and added really watered down ink to the white areas for the gray shadows. I decided not to paint a background, because I like her just as she is. This is not usually how I paint, so I was experimenting which is always fun. which is read sumi in Japanese can also be read as boku in Chinese, and as is true of most Asian art and culture, the roots of Japanese painting are found in China.” I didn’t know this until I chatted with my friend on Facebook who said, “…roots of many Japanese cultural things are found in China and Korea. Japan is the ‘youngest kid’ of the Far East. Haha!” So every day I am learning many things about Chinese and Japanese culture in my endeavor to learn their unique ways of painting and writing! It is challenging and fun. 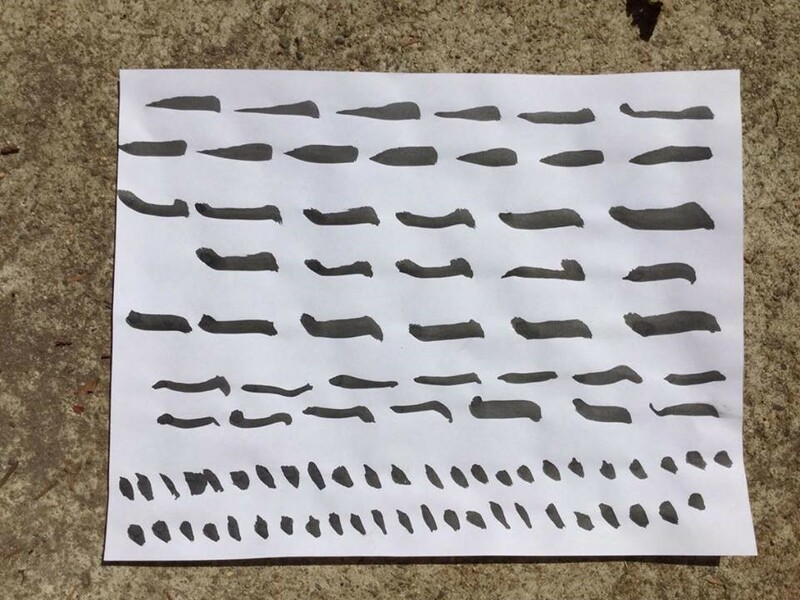 Here are a couple of pages I did in practicing strokes from the book “The Heart of the Brush” by Kazuaki Tanahashi. 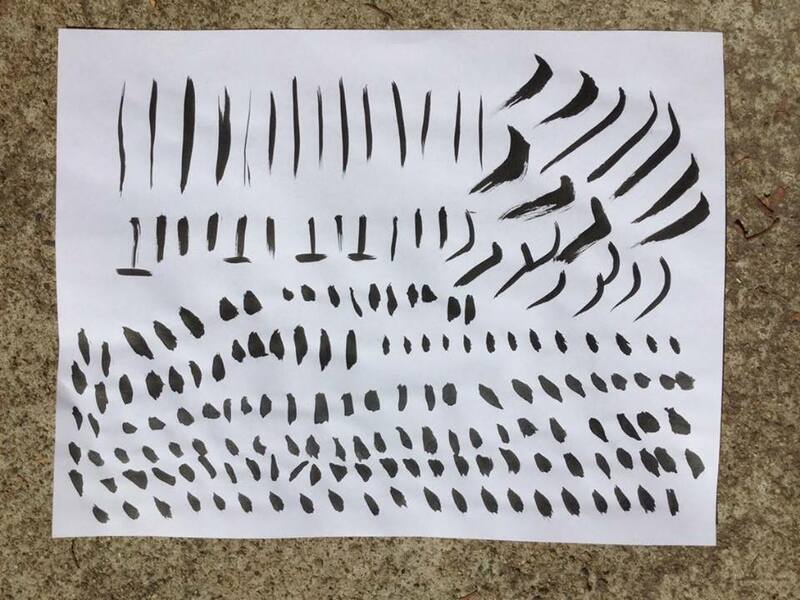 These are vertical, diagonal, horizontal and dew drop strokes. It is difficult to do to say the least! However, I am up for the challenge! I actually did these a week or so ago, but just hadn’t had a chance to post them. I am planning to get back to practicing later today. I wasn’t feeling very well the last few days, but I feel better today. So after a workout and a shower, I plan to get back to this!